This little corner was cluttered and hard to get around in her home. 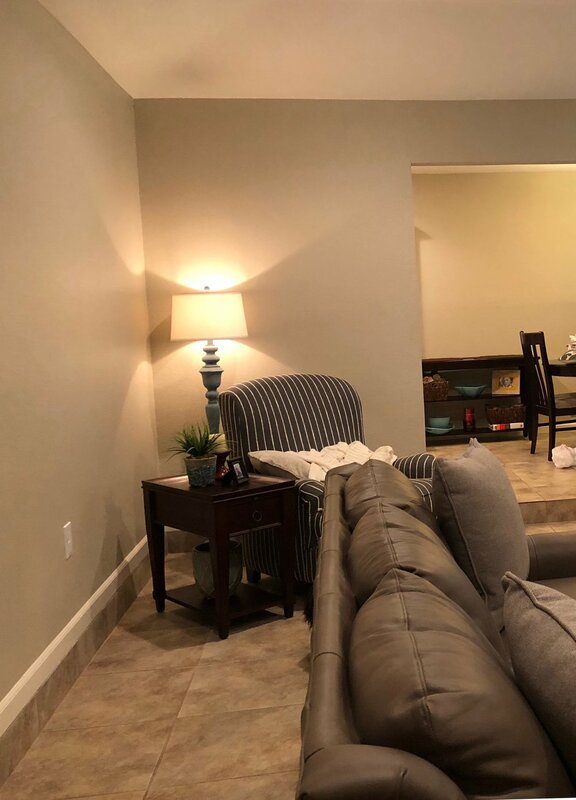 I decided to move the chair into the main living room and create a vignette that added some storage and decided this would be a great place to showcase some color. The color shows off her personality and makes the space feel inviting and sophisticated, yet relaxed and fun. Using blown glass balls, layered on a wood tray, continues the playful spirit this little corner expresses. The fresh hydrangeas will last a while and she will love replacing them as she entertains guests. They couldn’t be a better flower with that painting. This little corner is now a place where guests can put their purses, etc. when they come into her home or can be a place for her to sit to put her shoes on. I decided to use a half moon bench because it takes up less space. I love the whimsy of the pink and gray leopard pillow. The leaf starburst mirror is placed in the perfect spot above it too. The blue and white ombre pillow almost came home with me! The client had a rug in here before, but it was too small. This is one of the biggest mistakes I see people make. Your furniture should always sit on your rug, don’t let your rug float in the room!! As you can see my client also loves and collects birds. I decided to use the bird art on the mantel and placed all her birds that were on her mantel on a side table next to the sofa. Now they can all flock together. Because the living room is small, I decided to do an oval coffee table, so it is easy to get around. She didn’t have one before. It is always nice to have one to place snacks, etc. when having girlfriends over. Isn’t the blue and green rug gorgeous? As you may notice, I use a lot of blown glass. Also, not everything that is a vase needs a floral piece in it. Sometimes just left alone can be a showpiece. For some reason colored glass speaks to me. It adds color and shape and I find most people are drawn to it, especially when it is under a light. Don’t you also love how the drapes cozy up the home. They are stunning with the rug too. Notice that I don’t usually do matching items on each side of the fireplace. We moved the chair into the living space and it makes the room feel much more conversations now. I love a pin stripe fabric mixed in with a feminine vibe. The gray gave the room strength. She had just purchased this sofa and love seat, so we used it but just added some color. A grouping of fabulous mix and match assortment of pillows as well as a throw brings it all together and makes the painting feel less alone. We changed out her kitchen dining chandelier with a drum shade chandelier with crystals. I created the succulent garden for her dining table. We also added a mirror to that space to make it more open and of course it reflects the chandelier and you wouldn’t believe how much bigger it made the space feel. She was so excited during the reveal and it has inspired her to entertain again.